C-DAC (Center for Development of Advanced Computing) announced a few days ago the availability of the latest version of BOSS Linux. This release brings support for both KDE and GNOME desktop environments, and includes wide Indian language support, Bluetooth, PDF Viewer and RSS Feed Reader. Also with this release, a Memorandum of Understanding has been signed between C-DAC and NIC (National Informatics Center). This action has been taken with the purpose of implementing BOSS Linux on eGovernance applications developed and maintained by the NIC. BOSS Linux tries, and succeeds in being the optimal choice for government employees from India. The needs of this kind of users involve mostly office applications, like spread sheet or word processor, and of course, accessing multimedia and the Internet, all of them done in a safe environment. BOSS Linux has been proved to excel with this sort of tasks, while being absolutely free to install, use, modify and distribute. Another trait of BOSS Linux is that it brings technology to more people than ever before, by supporting many Indian languages and being very easy to install and use. These advantages and more make BOSS Linux the OS of choice for a great number of Internet cafes owners, as it is cheap, friendly, language-supportive and a more than adequate replacement for unlicensed proprietary software. 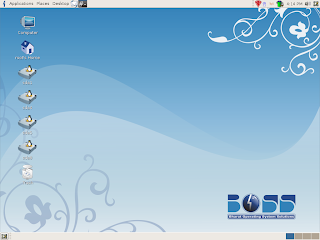 Download BOSS Linux 3.0 now from here.